I will be alternating offense and defense in these posts. Links for the previous posts can be found at the bottom of the page. Before I get into the nitty gritty of this particular training camp battle, though, here is some information I think we all are glad to hear. Takeaway No. 1—that was probably the most physical practice I’ve been to in a couple of years anywhere in the NFL, and maybe one of the five or six most physical practices I’ve been to in a dozen years covering the league. Hopefully it won’t just result in weeding out some guys via injury. Mind you, it doesn’t seem possible to avoid, no matter how careful everyone is. To return to the post subject, this particular battle was precipitated by the departure of Steve McLendon in free agency earlier this year. The Steelers apparently liked McLendon, just not enough to pay the going rate for a player who they would only use about a third of the time. After all, they had on the roster a young man who is one of the very largest in the NFL (I believe his size and poundage was exceeded by one of the players in this year’s draft, but he was definitely the largest guy in the 2014 draft). Although Daniel McCullers hadn’t been enough of a quick study to depose the incumbent, he had shown flashes where he seemed to be an immovable object (or perhaps irresistible force) in the middle of the defense. Other times he was pretty ineffective. So the Steelers, perhaps unwilling to anoint him the starting nose tackle without a fight, drafted a guy some believe was the steal of this draft—Javon Hargrave. And perhaps it will turn out this isn’t much of a battle, because the Steelers indicated interest in using Hargrave in other ways besides just as a classic nose tackle. So let’s take a look at the two men. 6’7″; 352 lbs. ; 36 5/8 arm length. McCullers has two main problems for a nose tackle—he’s tall and he’s a nice guy. A classic NT like Casey Hampton is about half a foot shorter, which gives him a lot more leverage. John Mitchell has worked extensively on the “tall” problem with run-under-the-sled drills. The “mean” part might be more of a problem in the end. It’s apparently pretty hard to get Big Dan riled up, and it would be scary to be the one to have to do it. [N]ose tackle Daniel McCullers did not record a tackle during his NFL debut last Monday night but his brute strength was impossible to miss in the third quarter. McCullers drove Chris Myers back about five yards on a pass play and the 6-foot-7, 352-pounder so overpowered the Houston Texans center that Steelers defensive end Cameron Heyward didn’t have to review film of the Steelers’ 30-23 win for the play to jump out at him. Last season he didn’t get much playing time, first because McLendon was available (McCullers started that game because McLendon was injured during the first part of 2014) but because McCullers was dealing with a torn labrum last season. He had surgery in the offseason and supposedly feels like a new man. Heyward, meanwhile, said the Steelers are trying to “pull out” a nasty streak in the soft-spoken McCullers. So it’s possible McCullers and Hargrave aren’t truly in competition. If you need a huge middle-clogger you send in McCullers, and you send Hargrave out the rest of the time. These two aren’t the only defensive tackles at camp. Let’s take a quick look at who else is new. Lavon Hooks played at a two-year school and then spent the 2013 and 2014 seasons at Ole Miss, where he lined up both as a DT and a tight end (!). That’s a lot of tight end right there. He’s another big but athletic guy, playing basketball as well as football at junior college. After going undrafted in 2015 Green Bay signed him as a UDFA, but cut him in August. He didn’t play at all last season as far as I can determine, so this is another chance for him. It seems like a pretty long shot, though. Roy Philon spent the 2014 preseason with the Steelers, but as a defensive end. After being cut by the Steelers he spent some time with the Bears and the Lions (sounds like he ran away and joined the circus) but has never played an NFL snap. He’s back now, but listed as a DT. At 6’3″ and 291 lbs. he seems undersized for the role. (That’s him behind McCullers in the picture.) Of course, anyone looks small next to McCullers, but his measurements don’t scream “nose tackle,” exactly. On the other hand, the Steelers must have liked something about him to give him another whirl. • The centers must hate one-on-one drills. Taking on Big Dan McCullers is no picnic. In run drills he is almost impossible to move. In pass rush drills he simply bull rushes whoever is in front of him. • When McCullers is subbed out in passing situations this season rookie Javon Hargrave should come in. He was excellent in pass rush drills against Chris Hubbard, whipping the third-year pro twice. Hargrave has a great first step. I’m now waiting for defensive line coach John Mitchell to have him go against Wallace or Pouncey. Hargrave wasn’t bad in the run drills, but it’s easy to see why there is some apprehension playing him in the base defense. His size could be a definite disadvantage if an offensive lineman gets his hands on him. • Depth along the defensive line remains a grave concern for me. 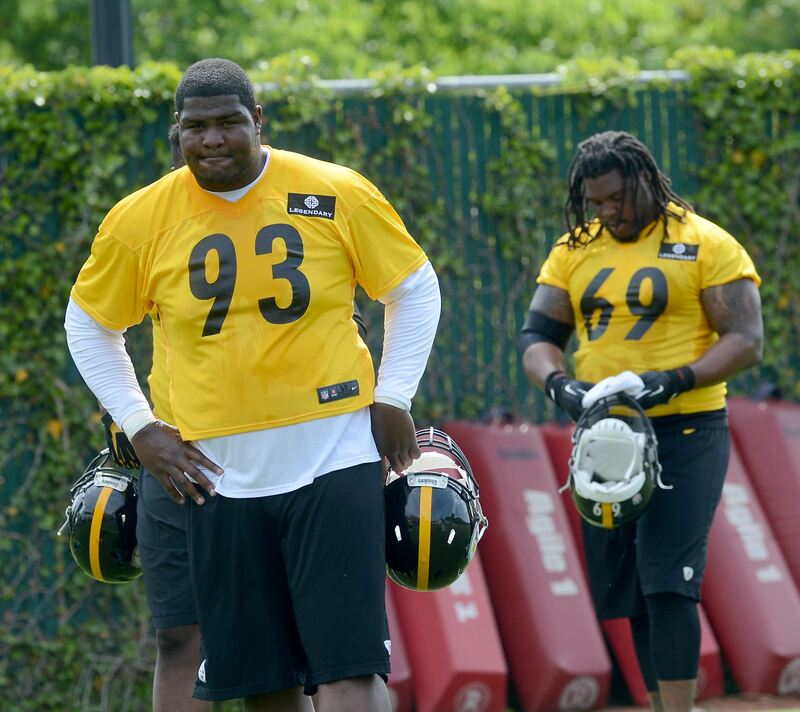 I just don’t know if there are NFL caliber players behind McCullers, Hargrave, Cam Heyward and Stephon Tuitt. There were no standouts among the young players in camp behind the starters. I think McCullers and Hargraves start from different roles. They want McCullers to be a run-stuffing immovable force on plays from the base 3-4, which last year was around 1/3 of the snaps. They hope McCullers can learn to be a pass-rushing force too by collapsing the pocket from the inside, but would consider that a bonus. By contrast, I think they want Hargrave to be a DT in sub packages who will rotate on a regular basis with Tuitt and Heyward. That’s 2/3 of the snaps, but reduced by the rotation. It would be gravy if Hargrave can play big enough to take the pounding required of a classic 3-4 NT, but that is not a major goal any more than Big Dan learning to play in sub packages. OTOH, both players can do the other one’s role well enough to prevent offenses from simply crossing the plan up; i.e., running on Hargrave out of a passing formation isn’t a gimme, and neither is passing from a heavy set just because Big Dan is in. It’s part of how the defense is adapting to spread formations and the new emphasis on speed over power. The team hasn’t found one NT who can do it all, so they are setting up to have two NT’s who can do half the job great and the other half okay. There’s a vulnerability because of injury concerns, but if everyone is healthy it ought to work fine. Esquire….and master story-teller, fever is impressed and am happy to say Scott is even more impressive in person.